Vicki and I had the blessing of spending some time in Maui over the past three weeks. I have grown to love that island and the time we get to spend there. It is simply a time of relaxing for us and gives us the opportunity to just enjoy the island. One day we drove up to Ho’okipa just past Paia. It is a place where a lot of surfing goes on. Although there weren’t many surfing that day we were able to see the shore covered with sea turtles. They had been there in the past but it seemed like the shore was just covered this time. I counted about 35 sea turtles that had come ashore and seemed to be enjoying the sun. In truth they all look like the rocks until you get up close to them. People would park and walk around to take pictures of them as they laid on the beach. We stayed in a different place but it was right across the street from a beach. Several times we walked across just for the sunsets and possibly catch sight of a whale or two. It was a very quiet location and we truly enjoyed it. Our neighbor told us about the sea turtles that laid on the rocks just off the beach. She said that often times you couldn’t see them because they looked just like the rocks. We hadn’t noticed them to that point. One day we went across to the beach and were totally surprised by what we saw. 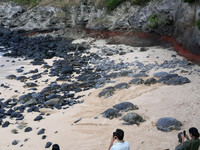 Along the rocks were five sea turtles that had crawled up out of the water and one that had come onto the sand. They were just lying there and seeming to enjoy the quiet shore breaks and the sun that remained. Whether they are at Ho’okipa or along the shore in Kihei, you don’t mess with the turtles. Their time on the shore is protected and people know not to mess with them. It is pretty funny how relaxed and at peace the turtles look when they are out there. Those turtles may not know their creator by name. They may not call on Him in a time of prayer. Yet they surely have the peace that He is watching over them during this time on the beaches and rocks. These turtles go through their daily activities simply moving from one point to another. They move slowly but diligently as they go from place to place. It is simply amazing to watch as you see this part of God’s creation. I don’t know the full scope of where they go or what they do, but God placed them there and watches over them. You and I may not know what all God has for us, but we can be assured that God has placed us here for such a time as this. He has placed His hand upon us and watches over us with great love and compassion. I believe that God directs the ways of those sea turtles and that He directs our paths as well. As He directs them to the rocks and sand to find rest, He directs us to find rest in Him. Have you found that rest in Him?